The USA can be seen as an easy country in which to do business and continues to be the UK’s number one export destination. UK companies approach the market directly, perhaps appointing sales agents operating largely on commission. American buyers like the reassurance of being able to contact their suppliers locally i.e. within the USA. This can result in the UK exporter realising that they need to set up a virtual or representative office with a local address and phone number. If you incorporate a company in the US, the US company can act as an agent or distributor, so the UK parent should decide on the best business model. As a distributor the UK parent will sell stock to the US corporation whereas under an agent arrangement the UK parent will invoice the US customers and pay a commission to the US corporation. It is a very easy process to register a company in the US but thereafter a UK company should obtain professional advice from specialists. It is important to obtain both legal and financial advice as the lawyer and accountant will give you their view on what needs to be done. For example, each state has its own legal and tax system. A US company has to file a tax return in each state if it has an office, stock, company registration, or even visits by salesman to that state! To celebrate National Export Week on 12-16 November, our new business guide ‘Exporting Made Easy’ will be available from this website at a specially reduced price of £7.70 for this week only. Last year the Government launched its export strategy, “Britain Open for Business” as part of a plan to boost the UK economy (ref.1). In November, the CBI made exports the focus of its annual conference and urged Britain to match the EU average of one in four businesses exporting (ref. 2). Yet export may seem daunting, or simply may be something a business hasn’t thought of . A British Chambers of Commerce survey found that one of the main reasons given by SMEs for not exporting was ‘they did not know how to do it’ (ref 3.) . A majority of exporters are in manufacturing but professional service providers lag behind with only 18% having export as part of their business. In this context the publication of the business guide to Exporting Made Easy and the associated website could not be more timely. With practical guidance on all the stages of finding and working with agents and distributors as well as sample legal documents, it looks at how to assess a suitable partner, gives case studies to consider and covers issues of culture, law, cross-border trading, how to deal with problems and much more. Authors Simon Bedford and Giles Dixon bring a wealth of experience to the subject. Simon has been providing export training and workshops for UK Trade & Investment for eight years after a long and successful career in export in the private sector. Giles has spent much of his career in commercial law overseas, and in 2002 founded ContractStore.com, a online provider of legal contract templates for business around the world. 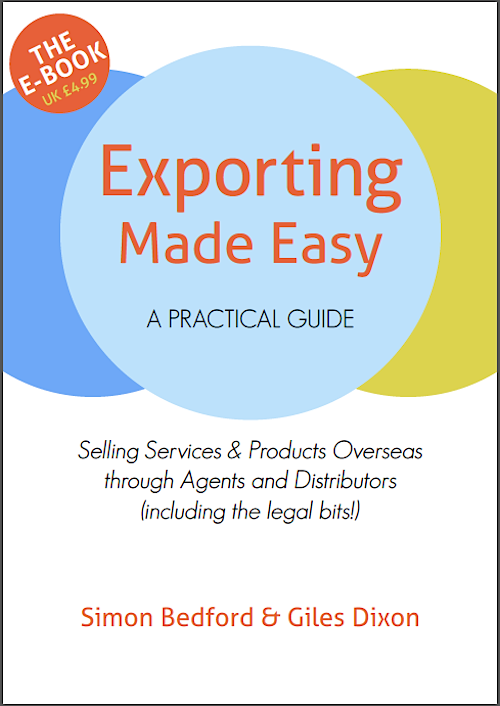 Described by Graham Hand, Chief Executive of British Expertise, as “a good read, easy to understand and encouraging to exporters”, Exporting Made Easy is designed for clarity, with its 109 pages divided into 25 short chapters covering all aspects of dealing with overseas agents and resellers. Any small or medium enterprise seeking new markets would be well advised to consult this work as a first step towards successful expansion and to help lift UK fortunes. The UKTI’s National Export Week runs from 12-16 November and so to encourage export and to support the UKTI efforts, we are offering a 30% discount all that week from this website. You may already know whether you require a commission agent, or prefer a distributor who can stock products locally in the market. As the export of services from the UK has expanded rapidly in recent years and there is no tangible product to stock, so an agent is often all that is required. However, it is worthwhile to examine the role and types of agents and distributors, as these terms are often used loosely. A distributor may refer to himself as an agent and vice versa, so it can be confusing. An agent does not have to buy the product or service from the supplier (or principal) and does not have title to (or own) the goods or service. The role of the agent is to find customers for their principal in return for a commission payment on any sales they arrange. Once the agent has effected an introduction, the supplier/principal will then sell the goods/services direct to the consumer. An Agent does not accept financial liability. Purchases products from a UK exporter/supplier and therefore has “title” to the goods purchased. The distributor then sells the goods on to the final customers having added his profit to the price. *Fixing the resale price is illegal in the UK and many other parts of the world. The most you can safely do is to have a recommended retail price (RRP).